On 9 March 2016, the European Union issued a new regulation on personal protective equipment (PPE), Regulation (EU) No 2016/425. for accreditation and market surveillance relating to the marketing of products. e) atmospheric conditions that are not of an extreme nature. acquisition of a CE-type certificate from a notified body. Another requirement is the annual control of the manufacturing process and verification of the gloves’ quality. Without such control the gloves cannot receive the CE marking. The notified body ID code (four digits) is placed directly after the CE marking, e.g. CE 1437. In compliance with the provisions of the Recommendation for Use Sheet no CNB/P/00/136, i.e. documents in which the European Commission publishes its recommendations for interpretation and application of Directive 89/686/EEC, on 1 January 2011 the notified bodies introduced the procedure of issuing the CE-type examination certificates for personal protective equipment with 5 years’ period of validity. All safety gloves shall comply with the requirements of the European standard EN420, setting forth general requirements and relevant research procedures concerning the design and construction of gloves and forearm protections, definition of size and comfort of use, dexterity, gloves performance and their inoffensiveness. It imposes on the manufacturer the obligation to correctly mark the gloves and enclose information on the method of use, storage and cleaning. Graphic mark signalling the necessity for the user to acquaint themselves with the information of the manufacturer enclosed to the gloves. 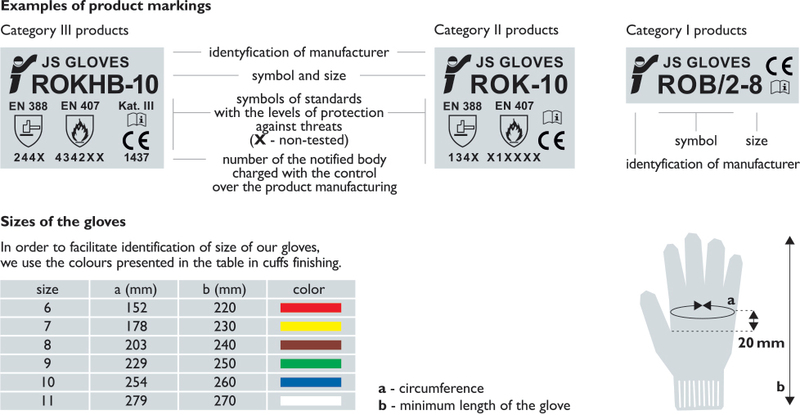 for Category III gloves, a four digit laboratory code placed after the CE marking, e.g. CE 1437. The standard sets forth the requirements, research methods, marking and information to be supplied with regard to gloves and forearm protections protecting against mechanical hazards such as abrasion, cutting, tearing and piercing. Such data shall be presented in the form of a pictograph including the number of the standard and data determining the level of protection against the hazards. if the result of the test after cutting a sample of gloves is more than three times higher than the result before cutting the glove material, then the suggested test method is that according to EN ISO 13997. 2) A fifth character (letter A, B, C, D, E or F) has been added below the pictograph, determining the level of cut resistance according to the ISO 13997 method, obtained after the test using the TDM-100 tool (tonodynamometer). 3) If, during the test, the material of the glove does not dull the test blade, then the Coup Test remains the test of reference. However, it is possible to voluntarily provide information on the resistance level according to the ISO 13997 standard. 4) Abrasion resistance test is carried out with a new type of sandpaper (Klingspor PL31B 180), which gives more repetitive results than the hitherto used one. 5) New test according to the EN 13594:2015 standard allows for provision of information on the impact protection level. If the gloves were subject to the test, letter “P” is added to the five characters below the pictograph. - puncture resistance: determines the amount of force required to pierce the sample with a standard sized point [N] (from 0 to 4). The standard sets forth thermal performance of safety gloves in protection against high temperatures and/or fire. Gloves protecting against hot thermal factors are gloves protecting the employee’s hands against heat and/or fire occurring at the work station in one or several forms, i.e. fire, contact heat, convection heat, radiation heat, fine splatters of molten metals, high volumes of molten metal. In accordance with the norm, the gloves shall comply with the general requirements and requirements concerning their resistance to abrasion and tearing. For each of the above parameters, four protection levels were identified, to be determined for a given type of glove based on the results of laboratory tests. Depending on the expected scope of application of the gloves, they should be characterised with relevant protection levels with regard to different parameters. Here, it should be stressed that only such parameters are evaluated which correspond to threats related to the scope of use of the gloves assumed by the manufacturer. 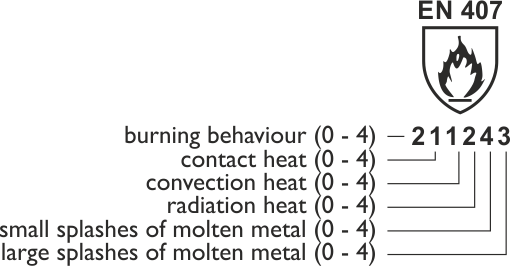 The table below presents the parameters and adopted corresponding protection levels in accordance with the EN 407 standard with regard to direct contact with hot objects. Gloves protecting against heat factors are marked with the pictogram presented above. Next to the mark, the number of the standard is given, i.e. EN 407, together with six digits of the code referring to the protection parameters. This standard refers mainly to gloves that are designed to protect hands against convection and contact cold, to the temperature of -50°C. The information on protection against low temperatures is given in the form of a pictogram with a series of 3 levels of protection, regarding given protection properties. The abrasion and tearing resistance of all gloves must be at least at the level 1. The standard sets forth the requirements and the methodology of research on protective wear capable of discharging static electricity in order to prevent discharges that may initiate an ignition. The standard does not require placing any graphic mark in the instructions for use of the product, but only the results of tests and conditions in which the tests were carried out. In the scope of certification of products admitted for contact with food we cooperate with the Polisch National Institute of Public Health – National Institute of Hygiene.